The Black Death, which killed 23m people in the middle ages, could be lying dormant and could strike again, say researchers. 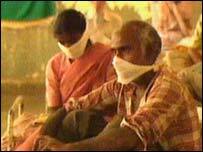 Their claim is based on the theory that the pandemic was triggered not by bubonic plague but by a virus. The theory is outlined in a new book by Professor Christopher Duncan and Dr Susan Scott of Liverpool University. "We believe this virus is merely lying in wait, ready to strike again," said Professor Duncan. The Black Death is thought to have caused the deaths of up to 200m people worldwide over the past 1,500 years. In the 14th century alone, around 23m people are thought to have died after the disease ravaged much of Asia and Europe. Globally bubonic plague affects between 1,000 to 3,000 people a year. However, if caught early it can be cured with antibiotics. As part of their research, Professor Duncan and Dr Scott studied original parish records, wills and diaries to create a profile of the killer disease. They examined eyewitness accounts as well as accounts by several famous figures who escaped infection, including Henry VIII and William Shakespeare. This research led them to conclude that the deaths were not caused by bubonic plague - a bacterial disease - but by a virus producing similar symptoms. Professor Duncan said the virus may still exist somewhere in the world. "Although the last known outbreak of plague occurred over three centuries ago, we believe the virus is merely lying in wait, ready to strike again." He also suggested that the disease if it does emerge again could turn into a major killer. "Globalisation and our increasingly mobile population make rapid transmission of infectious disease unavoidable - as demonstrated in the recent outbreaks of Sars. "These factors, combined with the increased threat of bio-terrorism, may allow for the re-emergence of the virus as an even more ruthless killer." However, Dr Michael Smith, a leading expert on plague, played down the claims. "For many years, there have been queries about whether the bubonic plague was responsible for the Black Death," he told BBC News Online. "However, much of the clinical descriptions certainly fit bubonic plague. A paper, published by French researchers recently, based on DNA tests on the remains of two people who died during this time also found evidence that it was bubonic plague. "The body of evidence suggests that it was bubonic plague."